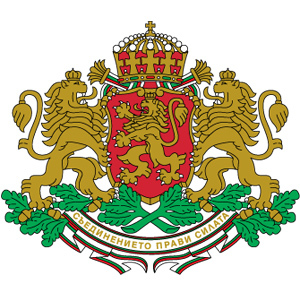 The Coat of Arms of the Republic of Bulgaria is a state symbol expressing the independence and sovereignty of the Bulgarian people and state. It has a rampant gold crowned lion on a dark gules shield. The shield has a crown, a prototype of which was the crown of the Bulgarian kings of the Second Bulgarian Empire, with five crosses and another cross over the crown. The shield is supported by two golden crowned rampant lions, facing the shield from left and right heraldic side. They stand on two crossed oak branches with acorns. Below the shield across the ends of the oak twigs with three white ribbon edge is written in golden letters "Unity makes strength". The national flag of the Republic of Bulgaria is a national symbol that expresses the independence and sovereignty of the Bulgarian state. The national flag of the Republic of Bulgaria is a tricolour: white, green and red fields placed horizontally from the top down. When placing the national flag in a vertical position, the colours are arranged from left to right - white, green, red, as looking at the flag. The national flag is rectangular. The fields of different colours are uniform in size and are located in a horizontal rectangle. The National Anthem of the Republic of Bulgaria is the song "Mila Rodino". The anthem is based on the music and lyrics of the song "Proud Stara Planina" by Tsvetan Radoslavov, written in 1885. "Mila Rodino" became the national anthem of the People's Republic of Bulgaria in 1964. With the adoption of the Constitution of the Republic of Bulgaria by the Seventh Grand National Assembly in 1991, "Mila Rodino" established itself as the national anthem of the Republic of Bulgaria.